War Eagle Caverns offers two types of tours. Guided Cave Tours leave the Trading Post every 20 minutes, daily and without reservation. The tour takes you on a leisurely stroll along the bluff of Beaver Lake to the cave’s spectacular natural entrance. From here you’ll follow your guide along the wide open pathway through huge rooms filled with amazing and strange stone formations. Your guide will explain both the geology and history of the area. You’ll learn about stalactites, stalagmites, flowstone, and bats as well as Native Americans, moonshiners, squatters, and outlaws. Looking for a more “in depth” tour of the War Eagle Cave? How about a Spelunker Tour? 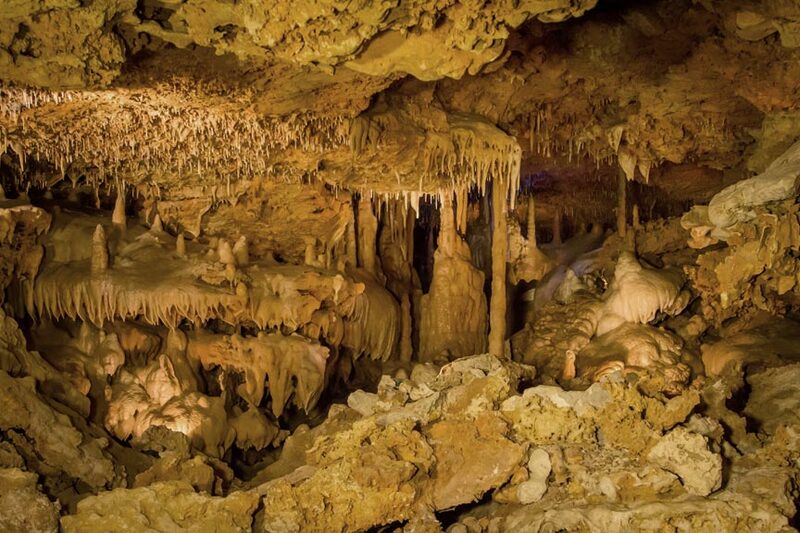 Guided Spelunker Tours start off right where the regular guided tours end – and you won’t want to be in your good pants. Spelunker Tours are wet and muddy fun, so you’ll want appropriate clothes – both for the tour and to change into when you’re done! Spelunker Tours are available mid-July through November and require 48 hour advance reservation. The fun doesn’t stop when you leave War Eagle Cavern. Topside includes scenic forest trails with waterfalls and views of Beaver Lake, limestone bluffs, and a sinkhole. You can also have fun in the Moonshiners’ Mystery Shack, get Lost in the Woods Maze, and pan for gemstones at War Eagle Mining Company. The Smoke Signal Cafe offers a good bite to eat in the summer, and the area provides many spots for picnicking and wildlife watching. Visit the cavern website for more information. You can also follow it on Facebook and Twitter. Whenever you find yourself in our neck of the woods, don’t settle for one of those cookie-cutter hotels or motels. Try a locally owned and operated Arkansas B&B instead. Top-tier amenities, personalized service, and an insider’s knowledge of the area will go towards making your stay the best it can be. Find your perfect Arkansas bed and breakfast now!